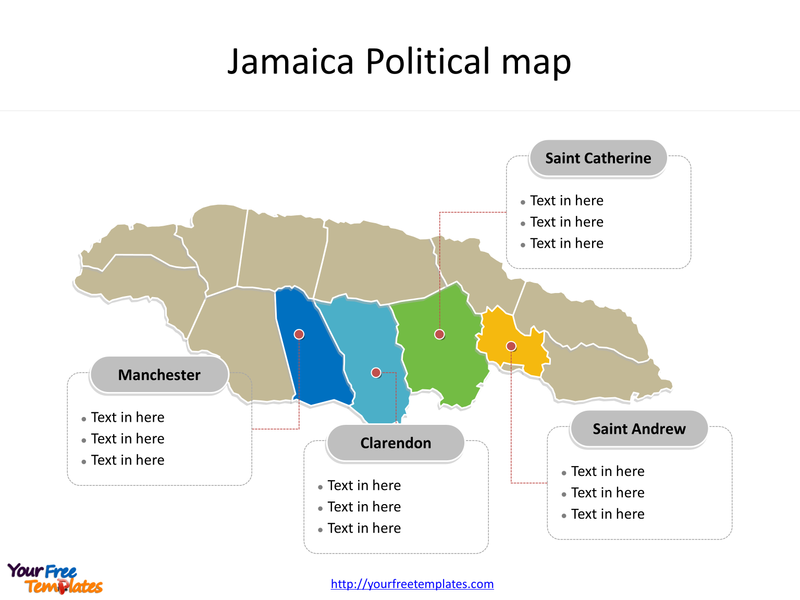 The Map of Jamaica Template in PowerPoint format includes two slides, that is, the Jamaica outline map and Jamaica political map. Firstly, our Jamaica outline map blank templates have capital and major cities on it. Secondly, there are 14 Parishes in our Jamaica map blank templates, labeling the most populated Parishes. 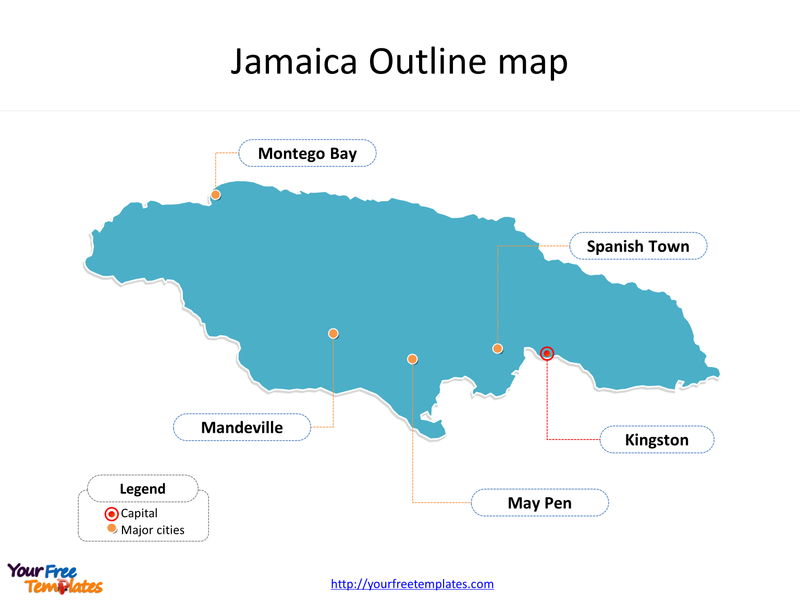 The Jamaica Map blank templates include two slides. Our Map of Jamaica is for the island country situated in the Caribbean Sea of North America. Firstly it is the third-largest island of the Greater Antilles and the fourth-largest island country in the Caribbean. Secondly Cuba is lying from the South. Thirdly Hispaniola (the island containing the countries of Haiti and the Dominican Republic) is lying from the west. Its capital and largest city is Kingston, other major cities including Spanish Town, Montego Bay, May Pen, and Mandeville. You can found them in our Jamaica map blank templates. Slide 2, Map of Jamaica labeled with major Parishes. It is noted that the Map of Jamaica is the country political division of 14 Parishes. Firstly, there are 14 Parishes; they are Clarendon, Hanover, Kingston Parish, Manchester, Portland, Saint Andrew, Saint Ann, Saint Catherine, Saint Elizabeth, Saint James, Saint Mary, Saint Thomas, Trelawny, and Westmoreland. Secondly, the most populated Parishes are Clarendon, Manchester, Saint Catherine, and Saint Andrew. What is more, every individual political subdivision is an editable shape. The labels and shapes are grouped by layers. In a word, you can change the texts, colors, sizes, highlight some map shapes, and add your charts. At the same time you can also refer to the fully labeled Map of Jamaica in Wikipedia. Believe it or not, analysts from marketing research companies, consultants from professional firms think highly of our website yourfreetemplates.com; most important of all, and our maps can help to reduce their efforts and create good-looking maps.